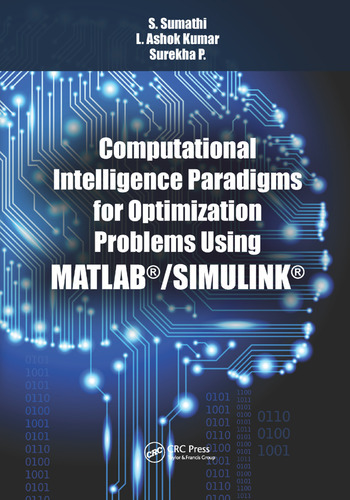 Computational Intelligence Paradigms for Optimization Problems Using MATLAB®/ Simulink® explores the performance of CI in terms of knowledge representation, adaptability, optimality, and processing speed for different real-world optimization problems. Computational Intelligence Paradigms for Optimization Problems Using MATLAB®/ Simulink® provides a valuable reference for industry professionals and advanced undergraduate, postgraduate, and research students. S. Sumathi completed her BE in Electronics and Communication Engineering and her ME in Applied Electronics at the Government College of Technology, Coimbatore. She earned her PhD in the area of Data Mining and is an Associate Professor in the Department of Electrical and Electronics Engineering at PSG College of Technology, Coimbatore. Widely published and highly decorated, Dr. Sumathi has 25 years of teaching and research experience. Her research interests include neural networks, fuzzy systems and genetic algorithms, pattern recognition and classification, data warehousing and data mining, and operating systems and parallel computing. L. Ashok Kumar completed his graduate program in Electrical and Electronics Engineering, his postgraduate studies with an Electrical Machines major, his MBA with a specialization in Human Resource Development, and his PhD in Wearable Electronics. He was previously a project engineer at ITC Limited, Paperboards and Specialty Papers Division, Kovai Unit, Coimbatore. Widely published and highly decorated, Dr. Ashok is currently a Professor in the Department of Electrical and Electronics Engineering at PSG College of Technology, Coimbatore. His research areas include wearable electronics, solar PV and wind energy systems, textile control engineering, smart grid, energy conservation and management, and power electronics and drives. Surekha P. completed her BE in Electrical and Electronics Engineering at PARK College of Engineering and Technology, Coimbatore, and her master’s degree in Control Systems at PSG College of Technology, Coimbatore. She earned her PhD in Computational Intelligence for Electrical Engineering Applications at Anna University, Chennai. Widely published and highly decorated, Dr. Surekha P. is an Associate Professor in the Department of Electrical and Electronics Engineering at PES University, Bangalore. A member of several technical bodies, she is a popular reviewer of journal and IEEE-sponsored conference publications. Her areas of research include robotics, virtual instrumentation, control systems, smart grid, evolutionary algorithms, and computational intelligence.